DHAKA, Jul 16 2013 (IPS) - When it comes to media, Bangladesh boasts some impressive statistics: it has the largest number of outlets among the world’s least developed countries (LDCs), including 50 nationwide dailies, of which eight are English-language newspapers; 25 television channels; seven FM radio stations; 14 community radio channels and over 300 regional magazines published in English and Bengali. But beneath this veneer lurks a dark reality: a near total lack of press freedom for journalists, who daily operate in a climate of fear, impunity and abuse. Watchdogs like the New York-based Committee to Protect Journalists (CPJ) have ranked Bangladesh the world’s 19th deadliest country for media, citing political pressure, censorship, arrests, detention, torture in custody, closure of outlets and extrajudicial killings as the most salient examples of a systematic attack on the country’s fourth estate. According to Odhikar, Bangladesh’s leading human rights watchdog, and other such advocacy organisations, as many as 21 journalists have been killed since 1992, three of them this year. During the first half of 2013, 120 media practitioners were subjected to severe attacks and 24 received some form of threat during the course of their professional duties. With so little for journalists to celebrate, it comes as no surprise that last month’s landmark court verdict on the murder of journalist Goutam Das – in which eight of the 10 people accused of plotting his death were handed down life sentences by the Dhaka Speedy Trial Tribunal – continues to echo in pressrooms around the country. Das, who at the time of his death was the Faridpur district correspondent for the Dhaka-based Bengali daily ‘Samakaal’, wrote a series of reports in 2005 exposing corruption by local businessmen connected with the then-ruling Bangladesh Nationalist Party (BNP). For eight long years his family and colleagues have waited for this ruling, which “marks the first time in Bangladesh’s 42-year history that the police thoroughly investigated the murder of a journalist and arrested the perpetrators, and that a court delivered a favorable verdict,” said Manjurul Ahsan Bulbul, a prominent journalist and former head of the Bangladesh Federal Union of Journalists (BFUJ). Many think the ruling has set a precedent for future cases involving journalists. The pending murder cases he refers to involve such prominent journalists as Saiful Alam Mukul, a reporter for the ‘Daily Runner’ based in the southwestern Jessore district; Manik Saha, correspondent for ‘New Age: The Outspoken Daily’ and the BBC World Service, based in the southern Khulna district; and Golam Mostafa Sarowar, senior news editor of the ‘Maasranga’ TV channel, and his wife, Mehrun Runi, a reporter for the Bengali-language ATN TV channel. The deaths of Sarowar and Runi – who were stabbed in their rented flat in the capital, Dhaka, at around midnight on Feb. 12, 2012 – sent shock waves around the country, with thousands still reeling from the news of their untimely and tragic passing. At the time, Home Minister Shahara Khatun declared a 48-hour deadline for arresting the couple’s killers. But a year and a half later, the culprits are still at large and angry reactions from the community – including protests organised by rights groups and students – have failed to spur the authorities into action. Such outstanding cases cast a pall of doubt over hopes that this recent ruling signals a turn towards greater press freedom. Widespread detention and the constant harassment of journalists in police custody have also worked to cement a feeling of fear, thereby increasing self-censorship. Noted reporter Saleem Samad who worked for the UK-based Channel 4 TV station was arrested in October 2002 for trying to produce a documentary based on reports that Bangladesh was playing host to jihadis from Afghanistan and beyond. The Bangladesh government charged Samad with sedition and conspiracy to defame the country. Upon his release after 50 days in prison, Samad described being brutally interrogated about his “motives” for shooting the film. He reported being woken in the middle of the night and taken to a small cell where an army officer with a pistol in his hand would force him to disclose information. Others have fallen victim to brutal attacks carried out by armed cadres of ruling political parties. Abul Bashar, a local correspondent for the Bengali-language national daily ‘Janakantha’ in the central Shariatpur district, was kidnapped from his office on Jun. 19, 2003, tortured and finally abandoned on the roadside with a fractured skull and backbone. 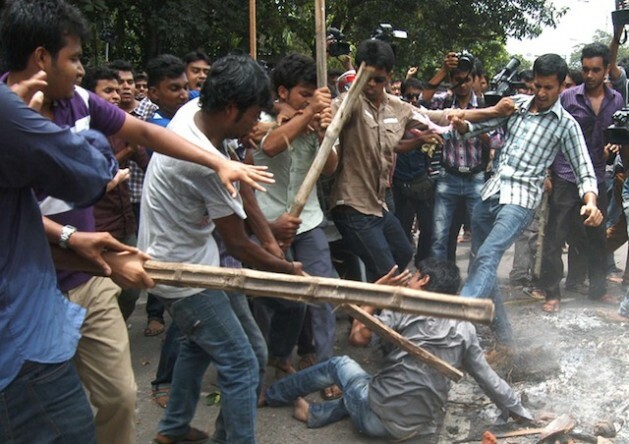 Armed members of the Jatiyatabadi Chattra Dal (JCD), a student wing of the then ruling Bangladesh Nationalist Party (BNP), allegedly carried out the attack. More recently, on Jan. 5 this year, activists belonging to the Bangladesh Chhatra League, the student front of the current ruling Awami League, allegedly beat and illegally detained Reuters reporter Andrew Biraz, New Age reporter Sony Ramani, Bangla News photojournalist Harun-ar-Rashid Rubel and Prothom Alo correspondent Hasan Raja as they were photographing a bomb blast at the Dhaka University campus. Odhikar also urged the government to arrest criminals involved in killing and attacking journalists. Watchdogs like the International Federation of Journalists (IFJ) have also made their concerns known through the release of situation reports on journalists’ rights and the state of media freedom in Bangladesh, citing torture, killings and detention as some of the many hurdles journalists are forced to clear before carrying out their work.